Discussed things with Steve, and from feedback from a number of you, we've decided to keep a single thread here in BGG as a long-running living thread that we'll bump up each week or occasionally. We'll continue to post on Facebook, so hopefully this will be a decent compromise and not too difficult of upkeep to maintain. Also makes it easier for people to subscribe to this one thread for any updates. There is a meeting of the Kanata Board Gamers every Thursday TUESDAY. The start time for the session is 6pm till approximately 11pm. We meet at the Kanata Community Christian Reformed Church (KCCRC) at 46 Castlefrank Rd, which is beside the Hazeldean Public Library. There is parking outside. Just go straight through the doors facing the lot, and you can't miss us! During the winter season we are kindly requested to remove any outside footwear when coming into the church to avoid tracking in the winter muck. So it's a good idea to bring a spare change of shoes. $2.00 will be collected from each person. The first $50 collected is donated to our gracious venue. Any left over will go into our board game library fund. Members can borrow from the library any time. Borrow it one session, bring it back for the next. Note if you want the discount cards (for Fandom II, Mrs. Tiggy Winkles, and Comic Book Shoppe), let Steve know, and he'll have them made up. 100% of the $7.50 fee goes to CanGames to support kids games, and the cards are good for 1 calendar year from the month you get them. Feel free to use this forum thread to discuss what to play! 3. Continue about 2km to 46 Castlefrank Rd, just past Hazeldean Rd. 4. Destination will be on the left, at the stop sign. Go up the hill. 5. Go through the doors facing the parking lot and into the main hall. 1. From Hurdman Station - Route 88 Kanata (not 88 Bells Corners) - get off at Hazeldean & Castlefrank. 2. From St-Laurent Station (through Downtown) - Route 61 Stittsville (during peak PM will be Route 61C only) - get off at Castlefrank & Hazeldean. 3. From Downtown (peak PM only) Route 267 Kanata - get off at Castlefrank & Winchester (the bottom of the church driveway). 1. From Terry Fox Station - Route 88 Hurdman - get off at Hazeldean & Castlefrank. 2. Also, the 61 does go by from Stittsville, but it doesn't have a stop that's right at Castlefrank & Hazeldean. The closest is Castlefrank & MacNeil, with a walk south to Castlefrank & Hazeldean. When walking south on Castlefrank, the church is on your left and is well signed. Go up the hill to the doors in the back facing the parking lot, and into the main hall. I'm bringing 18CZ this week. Is this the dark side? Someone mentioned cookies. Will there be a way to view posts on the Facebook page for those who are not on Facebook? I'm still sick so I can't make it out. This seems like a bad time to run TO Facebook. But Mark, apologised and everything! Tonight I am bringing Eldritch Horror, Historia, Imperial Settlers (if someone else could teach...?) and Roll for the Galaxy...as well as Tichu of course! Oh man! Eldritch Horror! I'd have been up for that. Is anyone interested in trying out World of SMOG: Rise of Moloch? I doubt there are many miniatures-based games played at the Kanata evenings (I've visited a few times), but if anyone is keen I could bring it next week. On April 5th I was finally able to make it out to the Kanata Board Gamers meetup again. Another good crowd playing at 5 tables. I joined Steve and John for my (and, I think, their) first play of Nations: The Dice Game. This game is on the lighter side where your dice pool builds over the four ages of the game. In each age you spend your dice to change your dice pool (moving from generic dice to dice that specialize in producing gold, military or science), gain leaders and monuments and gain end of age victory points for science and achieving the military and feeding objectives. I specialized in science with a little military mixed in. This helped build my lead on the science track. John went for economy early before pushing up on science. Steve went for military early before working towards high VP monuments. That turned out to be the winning move as we tied on final scoring and his military dice (which gave him first player) gave him the tiebreaker. Next, I taught Steve and John Coldwater Crown. John jumped out to the first points of the game by claiming a weight award (he’d get three others). Steve was catching fish like crazy and won the race to 8 unique species but I would soon follow and then go on to be the first to claim the small species challenge. Later, Beat out John to be the second one to claim the small species challenge. Steve triggered the endgame but John and I were both able to catch a fish or two more. Surprisingly, none of us were able to get one of the Master Angler challenge awards, a first for the games I’d played. It was a super tight game. I won the contests in 2 of the locations (taking third in the other) while Steve took first in one. It was a super tight game with me, John and Steve earning 27, 26 and 25 points, respectively. It was the tightest game I’d played yet. Finally, we played Imperial Settlers, a game we’d each played in the distant past so it was a bit of a learning game for us, especially me (as my play would attest). I played the Romans, Steve played the Egyptians and John played the Barbarians. Steve drew his initial faction cards well and was able to get several faction buildings out in the first round. John built a several production buildings in the first round while I managed one production building, a feature and a deal. Steve and John got nice engines running early and really ran them well. 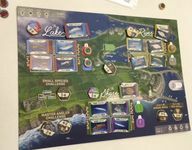 John's produced lots of in game victory points while Steve's large faction building tableau earned him lots of end game points. Steve's end game VPs were just enough to squeeze out a narrow win over John. Me? I was playing a different game it seems but didn't get doubled. Still lots of fun. I saw lots of other great games being played. These included Great Western Trail, Legendary Creatures, Rising Sun, First Class: All Aboard the Orient Express! and Harvest Dice. I was happy to make it out to the Kanata Board Gamers weekly meetup for the second week in a row on April 12th. My night began with Ryan teaching Chris, Evan, Oliver and me Mysterium. Ryan, acting as the ghost, gave us vague vision clues to point us to possible murders, locations and methods of murder. The discussion over what these clues could mean and the “betting” mechanism was great. Evan lagged behind the rest of us in discovering his murderer, location, and method which meant in the final round he had only one clue to look at to solve the crime. He guessed right, as did Chris. Oliver and I were, I think, stuck on how one clue had been used in the preliminary round and missed the more obvious association with we were deciding upon. Next, we played Between Two Cities, a clever tile drafting, city building game with the interesting mechanism that you are building shared cities with the players on your left and right but only your lowest value city scores. Chris, the player on my left, won the game while the city Ryan and I constructed scored the lowest. Finally, Ryan, Chris, Evan and I played Scoville. I am terrible at bidding and my three plays of this proved that. What I do really like about the game is that playing first or last in a round might have their own benefits. First player gets to draft peppers, plant peppers and fulfill orders/recipes first but last player moves through the pepper field first. Thats a tough choice, at least for me. Chris seemed to win the race for everything from picking up “first to plant” awards to beating me to the order and recipe cards I was targeting in the final round. Consequently, he doubled me up. Evan, in his first game, finished second. Other great games I saw played included Puerto Rico, Automobiles and an 18xx game that was originally described as “Bob’s” game. At first I didn’t realize it was HIS game. Congratulations on the publication. It looks terrific. We had a few new faces and some that haven't made it out in awhile. I was in the other table of 5 with Michael, Costa, Paul, and Luc. We started with a classic: Puerto Rico. Most of us had played before, but it was Paul's first time. PR is one of my favourites; it has a really nice mechanic of selecting actions that are shared by everyone but where the person selecting gets an added benefit. Interestingly, it was Michael who had taught me the game many moons ago. PR was my gateway game into "heavier" Euros back when I was starting out. I managed to get the dream combination of harbour, warf, and customs house, which I used to get a good lead. The fight for second was actually quite close with Costa and Michael a point apart; they each had half of the warf/harbour dream. Our second game was Automobiles, which is probably my favourite racing game. It plays similar to a deck builder, masked in the form of cubes in a bag. We had a really nice random set of special abilities for our coloured cubes with 2 abilities that helped movement for a wear cube. And another cube type that could easily purge the wear cubes. I purged some of my cubes out early and managed a nice distribution that paid off in some well-timed pushes around the track. Michael had a really good final turn falling a bit short and managing second, whereas Costa had engine problems or got distracted by the track girls and ended back of the pack. There was a great crowd for the KBG meetup on April 19th. Ryan was good enough to teach Mike, Dean and me The Manhattan Project 2: Minutes to Midnight, a worker placement game about the Cold War nuclear arms race. There were a few really interesting things about this well-produced game. First, different types of workers that specialized in different actions. Second, the worker placement mechanic where you could place workers on two different action spaces on your turn or, recall all your workers that have been placed to execute the actions. Third, the presence of spies who can use different buildings on other players boards at the level of the player whose board they are placing on. Fourth, 4 different scoring rounds. The first three score bombers, subs, ICBMs and missiles deployed to Third World Countries. The game ends with a final scoring round that scores all four categories. The scoring was a bit opaque to me so I decided to go for Anti-ballistic missiles, which presented opportunities to score in each round. Ryan got off to a fast start in the first round, placing bombers in everyone else's sky while boasting a clear sky himself. Dean specialized in subs, scoring well in the second scoring round. Mike scored big on ICBMs and then also stretched his lead in the battle for influence over the third world countries, which Ryan also scored a bunch of points in. Going into the final scoring Mike had more than doubled my score. But, I scored big on subs and my defense rating also got me a bunch of points. Nevertheless, I still ended up in third, 24 points behind Mike's winning 89 points and 8 points behind Ryan's second place. We all agreed that the key to this game was controlling tempo and triggering the scoring rounds or predicting when they were triggered so you got in key actions before then. Thanks for teaching us Ryan. Lots of other great games were played. These included: Too Many Bones, 18CZ, The Networks, Ora et Labora, The Palace of Mad King Ludwig, Automobiles and a Wing Leader game. We got a Facebook now? Wow, fancy. It was another fun night with the Kanata Board Gamers on April 26th. On Wednesday at OGG I saw Frank had Lewis & Clark with him. That inspired me to bring it to KBG and Frank had his copy with him. That was enough of a sign for us to play this terrific hand and resource management, worker placement racing game. We taught it to Chris, Niall and Paul. Paul and Niall both went heavy on Native American guides, more so than I'd ever seen before. They both comboed this with expedition members who keyed off that. Paul's gave him river movement based upon the number of Native Americans still in his canoes and Niall's allowed him to use any worker space on the board which he used to great effect by powering it multiple times each play to accomplish a lot on any given turn. Chris had a recruitment bonus and used that to great effect to recruit expedition members who did a variety of things. Frank got shut out of getting boats to carry extra resources or Native Americans and that severely hampered him. I got myself a couple of boats for resources and my movement came in infrequent big chunks. In the end Niall prevailed, moving far past Fort Clatsop before taking one last turn and camping. Next, Frank and I taught Niall and Paul Rialto, a card drafting, area influence board game. Niall jumped ahead on the Doge track early in the game and, while we would trade it back and forth a couple of times, got lots of benefit from it and ended up on top of the track at the end of the game...a point that would prove important. Niall and Paul both established early board presence with Niall winning the race to presence in all three light colored districts and taking 5 points. Paul did a great job of establishing presence in all but one district. Frank and I both focused on building and by the end of the game I had two of the "4" buildings for the draft phase giving me lots of options late in the game. I turned this into great presence in the blue districts and won the race to first presence in all three of those. For the first time in my experience there was one district that only scored 4 points in final scoring. That was tough luck for Frank who had a majority there. In the last round Niall (and his lead on the Doge track, which he'd just taken) edged me out in the gondola phase which allowed him to tied me in councillors in district 5. In the final scoring his lead on the Doge track would give him majority points for that district and it would prove the winning margin, with me finishing second and Frank and Paul tightly bunched just a few points back. Other great games I saw played included Hansa Teutonica, Indonesia, Century: Golem Edition, Tiny Epic Galaxies and Welcome Back to the Dungeon. Another solid turn out last Thurs, though people opted for 3 large tables of 5 players each as oppose to smaller groups. Our table consisted of Matt, Danny, James, Kurt, and myself. We decided to tackle a longer game that took most of the night: my favourite Splotter game, Indonesia. A good representation of Splotter, Indonesia is rules light(-ish), but has a really elegant depth in strategy. It's a mix of goods-delivery, auctions, and operating companies, with some really tough decisions for R&D progression. Kurt took on the role of sowing chaos by advancing his ability for "Mergers" early, and proceeded to merge people's companies away from them. Although he took much enjoyment out of it, failing to upgrade his "Slots" restricted him from owning more than one company the entire game, causing him to slip behind in cash flow. I was one of the beneficiaries of Kurt's merging-sprees, acquiring the first siap faji company. Paired with early upgraded "Expansion" R&D, I had a strong mid-game raking in solid profits from controlling a monopoly on microwave dinners, which ultimately outpaced everyone else. The middle of the pack was embattled with the shipping companies exchanging hands multiple times--Danny and Kurt being the primary operators for most of the game, but I somehow became the proud owner of the sole mega-shipping company for the final round. Matt, being his first play of the game, had a slower start, but was quietly accumulating funds operating a little of everything. He got his hands on a rubber monopoly (another result of one of Kurt's mergers), which did extremely well in the final round, allowing him to edge out James for an impressive second place finish. I was sowing chaos indeed. Thought about slot upgrades, but then thought that if they don’t start with two, then why should you have to increase it. Maybe I was just feeling contrary, testing the limits and logic of the game. It was a bunch of fun though. I wonder if it would have been closer at the top had Danny been willing and able to win the last shipping merger, rather than evaluating the auction based upon return on investment calculations. Not sure which of you had the most money at that point. All the investment plans went out the window when the last round happened so quickly. I think if you start with a company that makes some money in the first two rounds then maybe you can make more money from mergers, and make a one slot strategy work - or it’s just not possible and I can grumble about forced upgrade options. Being short of cash when merging is not a recipe for success and I didn’t make enough money from the shipping company operation in the first two rounds to make any more from mergers late game. Just to let you know we're setting up downstairs this week. On the up side, there will be choral music accompanying our play, gently wafting in from upstairs. My last chance to test the tweeks I've made to 1865: Sardinia before running it at Cangames. It can play up to four. Any volunteers? A heads up, albeit a few months out, but come September, due to some conflicts we will no longer have access to the upper main floor. We do have the option of continuing in the rooms downstairs as we've done occasionally in the past, remaining on the Thurs; or changing the meeting to an alternative night (Tues or Friday). A third option would be to relocate to a different venue. So opening discussion to people's thoughts, preferences, and/or brilliant ideas? As it stands, we're likely to just move downstairs. Some things to mull over, and hope to see people out tomorrow. I haven't been out in a long while due to schedule conflicts with family but I am planning to be there tonight and over the summer. Would we have access to the large open area downstairs or just the small rooms? I've always found the rooms to be small and stuffy. Of course Tuesday works for me. Friday would be out. I didn't think of this last night, but you might consider putting up a poll about the date/room change. I'd prefer Fridays over Thursdays, and I can't do Tuesdays, but I'm sure I'm in the minority. There's still another group that'll have use of the open area downstairs as far as I know, so we'd be regulated to split ourselves across the 4-5 rooms downstairs. For those not familiar with downstairs, one of the rooms is generally big enough for two tables, but most of the others would be single table. The rooms are without windows, so can be a bit small and stuffy. That's a good idea. Lemme see if I can put a poll together. As a result of relinquishing the main floor of the church on Thurs come September, we have a few options from changing dates to relocating. What is your thoughts about moving location/days for the KBG meetup? My thoughts on this are as follows. I like the current venue but I'm not a big fan of being spread out in rooms downstairs. Also having to disperse into individual rooms isn't conducive to new members joining. The current venue is roomy with lots of natural light when the sun is out, it's in a good location with abundant parking and I believe it is inexpensive to rent. I also like that we can rent it until 11, city of Ottawa facilities tend to shut down at 10. Finding a new venue as good as this would be challenging. If we are moving nights I'd strongly prefer Tuesday to Friday. I prefer a weeknight to the start of the weekend. That being said, if we did move to Friday could we extend the end time to midnight to facilitate playing longer games? Unless we can find a venue almost as good as our current venue, I'd prefer moving to Tuesday nights. Otherwise, I'd suggest using the downstairs rooms on Thursdays. Cangames 2018 open gaming was a great success! Thanks to volunteers: Joe, Charles, Maryeve, Ashley, Mandi, Ken, theSteve, and mark! I brought 66 games for the library and others augmented it with at least 22 more! Between Friday and Sunday, we recorded 79 games borrowed. 20 Games were played at least twice and 5 at least 3 times. There were 56 unique games played in all. Thanks to Mandi for bringing a bunch of hot new games! I personally had fun playing Drop it! Altiplano and Space Base.